Insight Treatment Programs and Clearview Treatment Programs is facilitating the next Adolescent & Young Adult Resource Network (AYARN) meeting on September 16th, 2016 at 8:30 am. 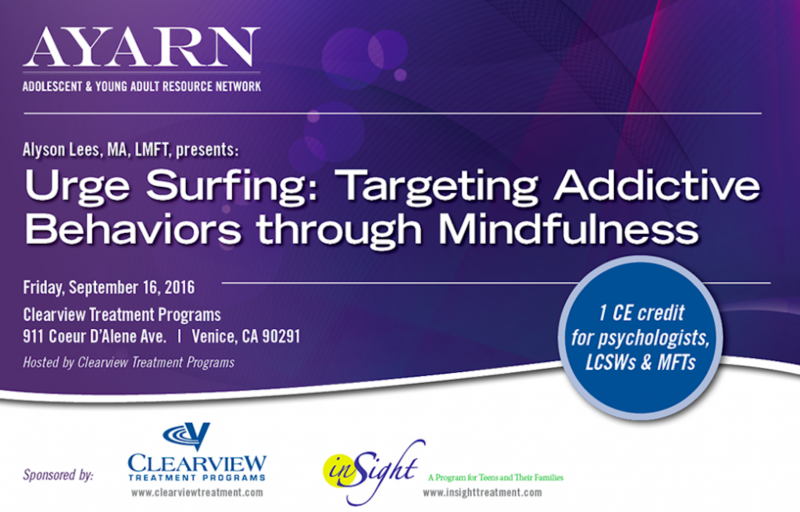 Alyson Lees, MA, LMFT will present how to target adolescents and young adults addictive behaviors through a Mindfulness technique called Urge Surfing. The technique can help clients develop awareness of their urges to use and teach alternative coping skills. The presentation will give 1 CE credit for Psychologists, LCSW’s and MFT’s.